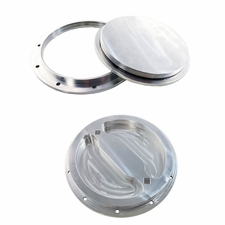 Replace the original lid on your aftercooler/intercooler tank with this all Billet two piece lid with true 6" big mouth opening for easier filling. Bolt in installation with a easy to remove screw top lid lined with an O-ring for perfect sealing. Flange has an 8" outside diameter and bolt pattern is 7 1/8" center to center across. Inside diameter is 6" across. Requires cutting/drilling of your tank. Installs in 60 minutes or less with supplied hardware. May require cutting tank for larger opening and drilling holes for mounting hardware. Any vehicle with an Aftercooler or Intercooler Tank that uses a true 6" opening. No one else can stack up to the bold clean styling of our aftermarket Billet dress ups, Street Strip & Racing Suspension & Performance Parts for your late model American Muscle Car! Any vehicle with an Aftercooler or Intercooler Tank that uses a true 6" opening.